APC Battery Backups, Reconditioned UPS's. replacement batteries and rbc's. Uninterrupted Power. Uninterrupted Protection. Uninterrupted Peace of Mind. We recondition our product here in our Rockwall, TX (East Dallas) facility. We clean, repair, calibrate & load test each unit with new high quality OEM spec'd batteries. 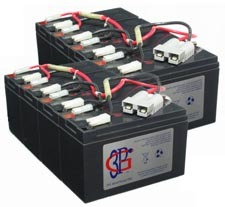 We offer a full line of replacement batteries for ALL APC UPS's, known as RBC or Replacement Battery Cartridges.